"He teaches guitar at your pace, he helped me a lot "
Would you like to learn guitar? Paul Cattell is a great guitar tutor! Paul - the guitar tutor, is available to teach guitar during the daytime, evenings and weekends, either from his purpose built teaching studio in Chipping Norton or via home visits. So if you are a complete beginner or an advanced guitarist looking for a boost to your playing then get in touch. Lessons can be either acoustic or electric and most music styles can be covered - pop, rock, metal, blues, funk, jazz are just some examples. Lessons will be tailored to your own personal tastes and musical goals. Whether you want to play just for fun or intend to make a career out of your guitar playing. Paul Cattell is resident guitar tutor at Chipping Norton school and can arrange in-school tuition for any pupils who want their lessons during the school day. Guitar Students wishing to gain qualifications then grades can be worked towards via either the RGT or Rock school syllabuses. 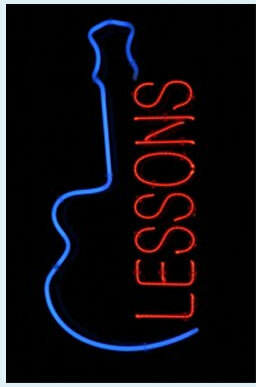 Regular guitar lessons at the studio start at £20 for 40 minutes and £26 for an hour. For budding guitarists with busy lives that want ad hoc or more periodic lessons at the studio, or for troubleshooting lessons at the studio to get you over a hump in your learning £20 for 40 minutes or £26 for the hour. If you want guitar lessons at your home then an extra traveling/mileage fee will be agreed in advance. Guitar Lesson Gift Vouchers are available on request, just contact Paul for a quotation for that present with a difference.